Reviewing self-help books are always difficult to review because they are not across the board open for everyone. The subject matter can either speak to the reviewer or it can just be empty reading which makes it hard to review therefore making it hard to give a positive review but that is not the case with this book. There Is A Miracle In 21 ~ God Completes will speak to you even if you are not a religious person because it gives you hope. Lorieen D. Henry is the author of this book and she is speaking of her journey of trying to become content in her life after making life changing decisions. At some point in our lives we all have made decisions that have been life altering and have struggled with those decisions but how we get through them are different because we are all different people from different backgrounds This book explains how Lorieen dealt with her decisions through prayer and letting God lead her through. She gives her examples of what she was dealing with and how she tried to deal with it and she gives scripture and prayer to show how she made it through. This book is an easy read and it breaks down into a 21 day plan of just trying to make it through this journey. As I previously stated it is a read that anyone could relate to even if you are not religious, it shows that you can make it too! 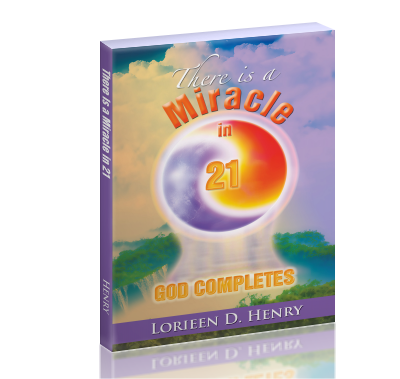 There Is a Miracle In 21 ~ God Completes! is available for purchase on Amazon.com(Paperback, hardcover and Kindle), Amazon.co.uk(Paperback, hardcover and Kindle) and BN.com(Paperback and Nook).